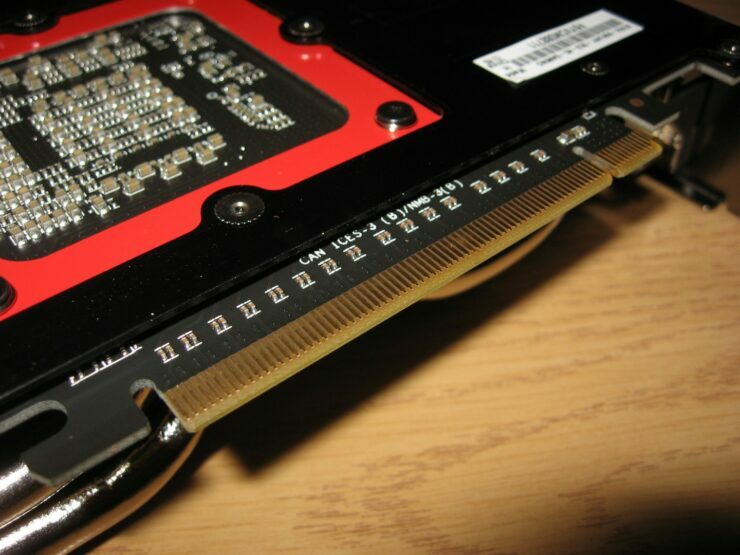 Back in June 2015, AMD launched the Radeon R9 Fury X that featured their top of the line, Fiji XT GPU core. 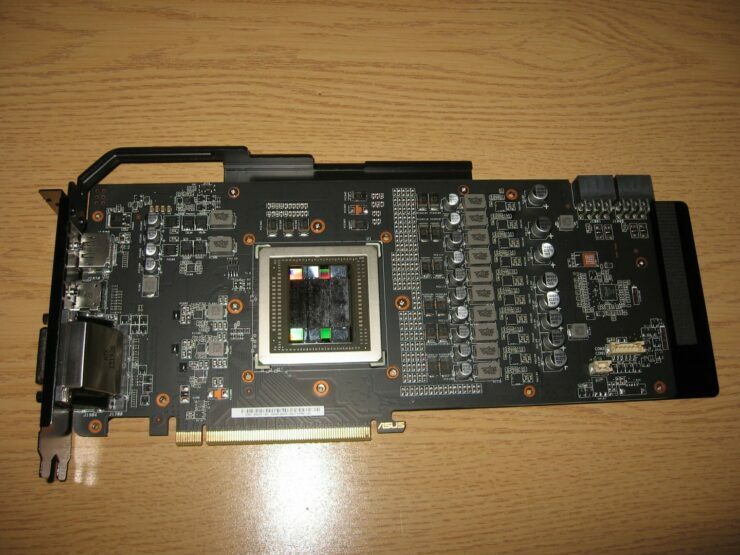 The Fiji chip was the first chip with HBM memory fused on the same interposer which hosted the GPU die. 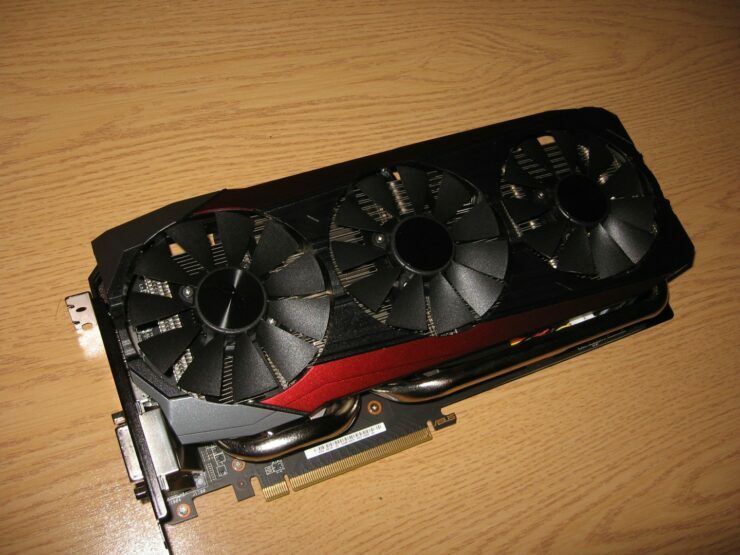 The GPU was great in every sense but failed to deliver on overclocking promises that AMD made during its launch. 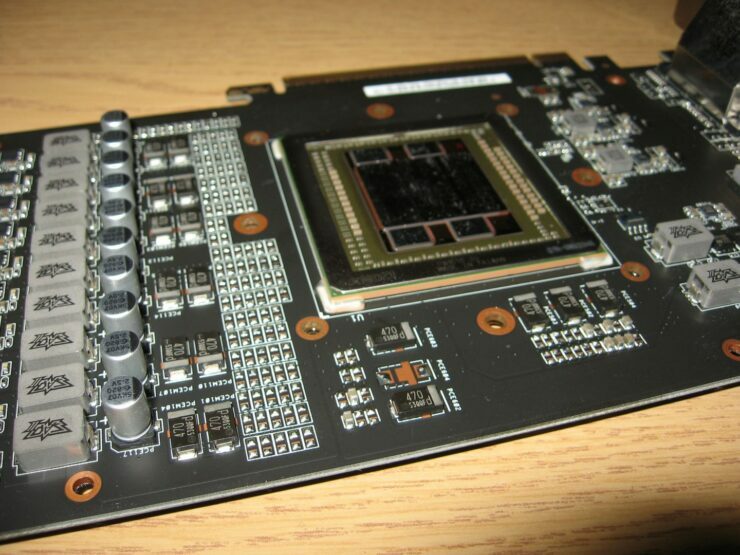 ASUS and a few other manufacturers came up to the scene a month later with the custom Radeon R9 Fury models that promised better overclocking potential through modified PCBs and with new tools that can unlock GPUs in to fully unlocked chips, now seems to be the best time ever to put the Fiji chip to the test. 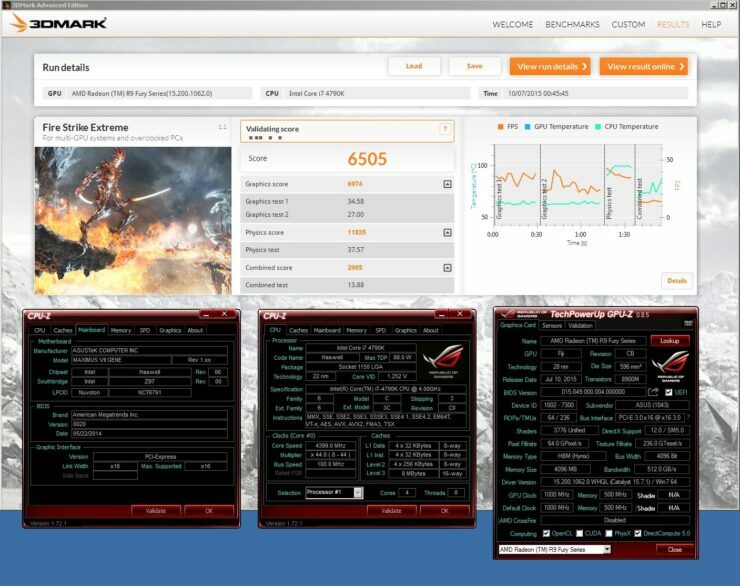 The latest overclock on the Radeon R9 Fury comes from Xtreme Addict on HWBot (Team Pure) who has clocked an ASUS Radeon R9 Fury model to extreme heights. 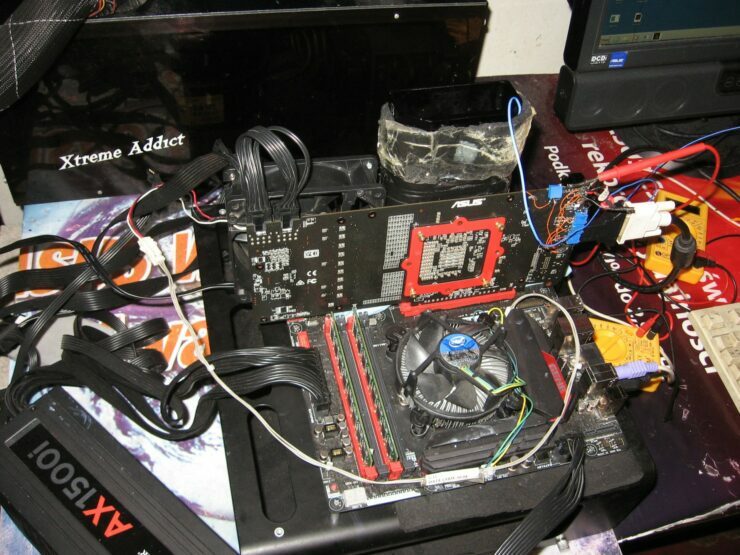 The overclocker posted a lengthy guide and tips on how to overclock the Fiji Pro model. 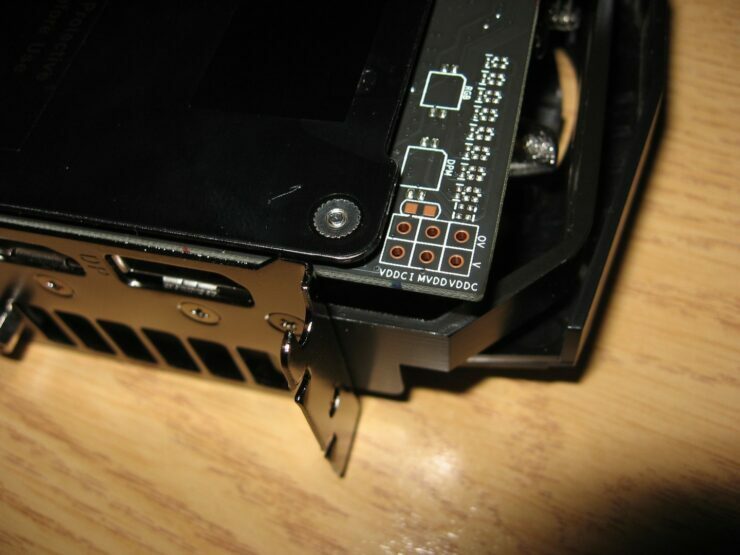 But that isn’t it, the overclocker managed to fully unlock the Fiji Pro based GPU in to a Fiji XT chip. 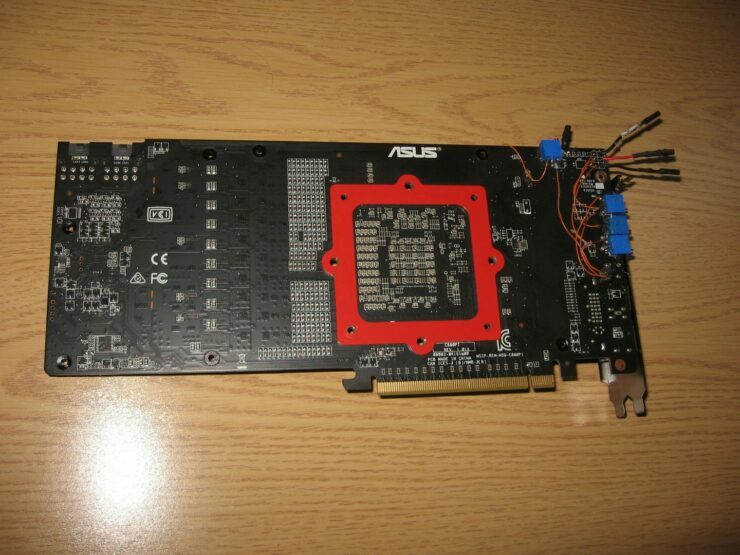 There are reasons to which the ASUS based R9 Fury was the card of choice since the STRIX card adopts a modified PCB that is meant for overclocking. Last month, when we were covering the launch of Fury Pro, it was seen that AMD featured the ASUS card in specific in their launch slides which showed that the card was quite important to them and ASUS too. 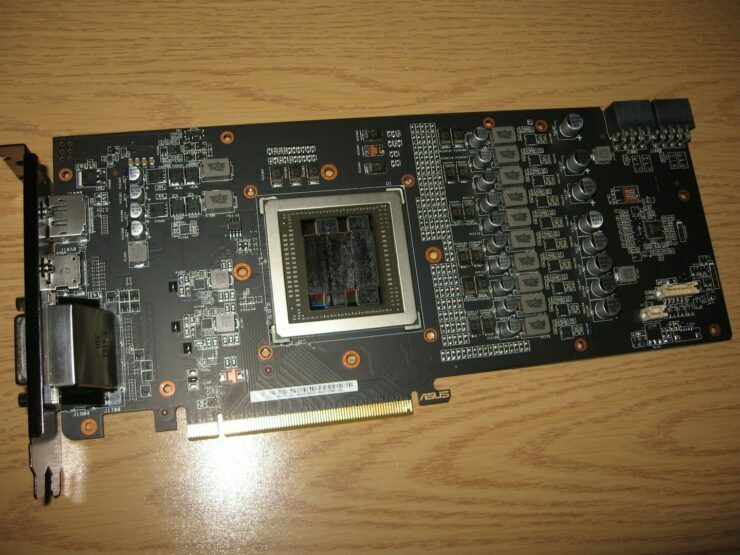 There was no reference design for the Radeon R9 Fury but some AIBs did use the reference R9 Fury X PCBs such as Sapphire and Powercolor on their Fiji Pro based cards. 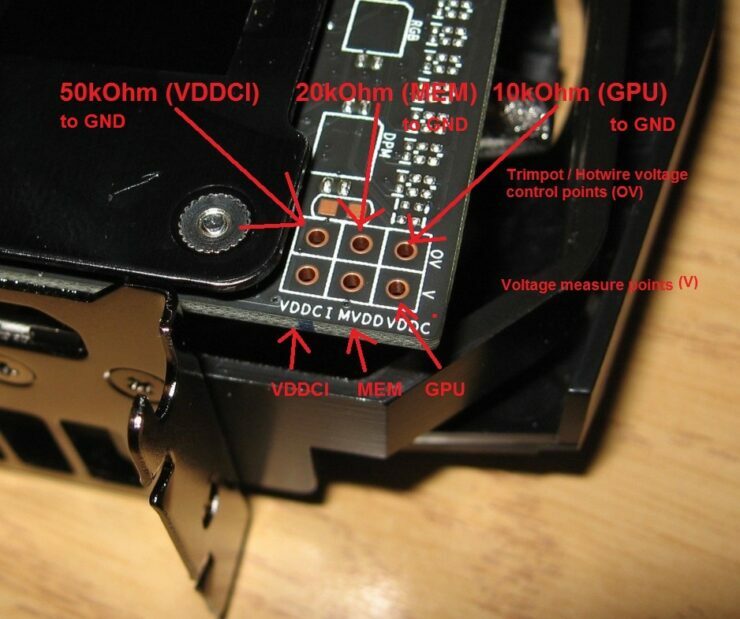 The Radeon R9 Fury X PCB, while compact, doesn’t has enough headroom left to provide overclockers the ability to mod their cards. 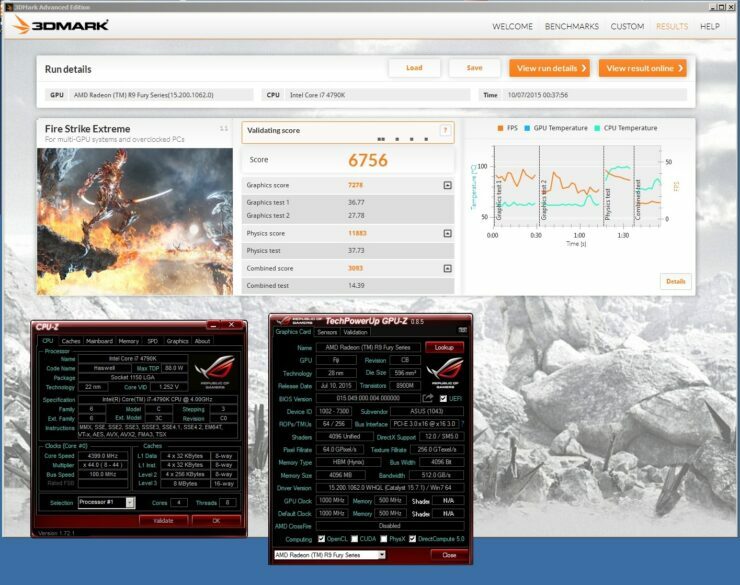 The ASUS Radeon R9 Fury breaks that barrier and gives users full control of the card, given that they know how to overclock this extreme. 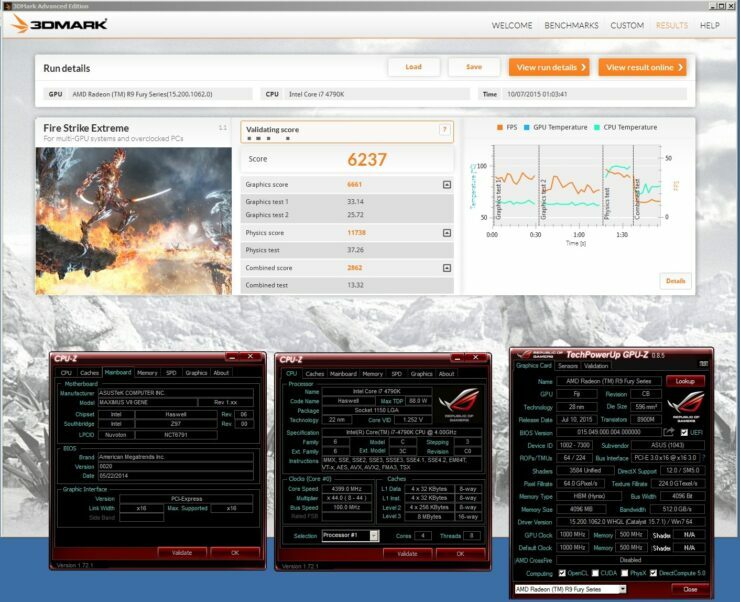 Before the overclocking began, the ASUS Radeon R9 Fury was tested in four configurations as a part of the stability check. Below, you can see the scores obtained by the card at stock specifications and with shaders unlocked. Shaders were unlocked in three steps, first step was 3776 shaders with 236 TMUs (59 CUs versus reference 56), second step was 3840 shaders with 240 TMUs (60 CUs versus reference 56) and finally 4096 shaders with 256 TMUs (64 CUs versus reference 56). The unlock was fully stable and even left some over clocking headroom. 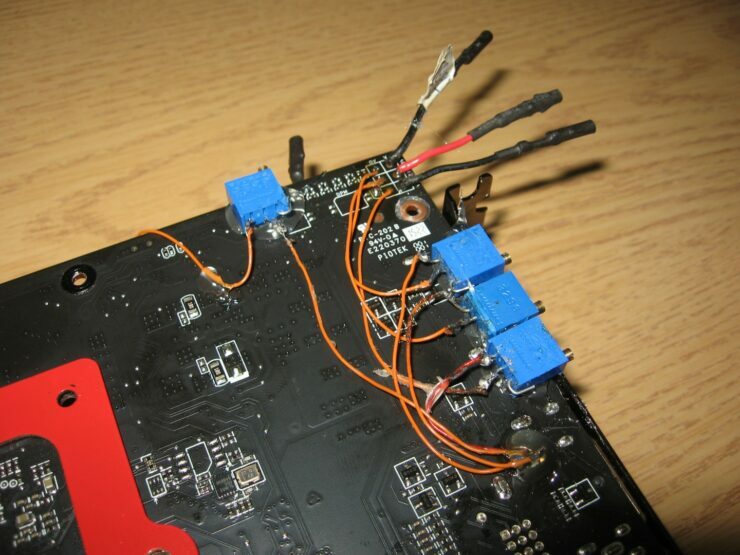 The overclocking steps required hot wiring specific sections of the card for which a comprehensive guide is posted. 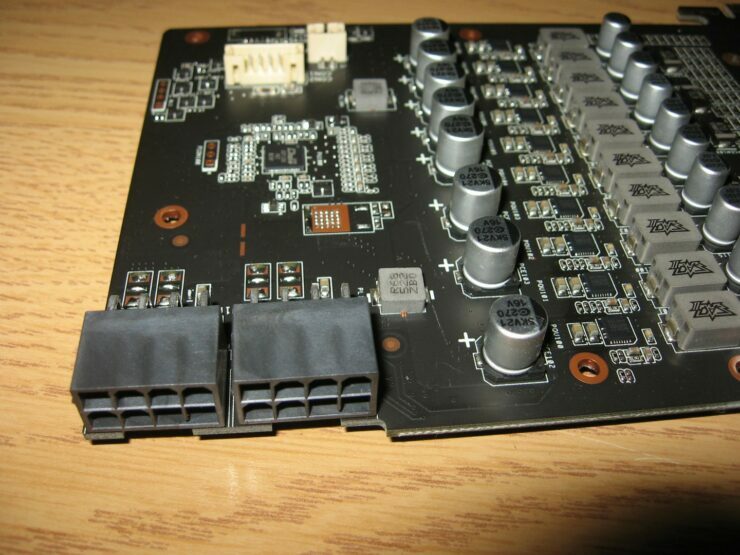 Do note that this is for users who want to overclock on LN2 and every process should be done at your own risk since this can permanently damage the card. 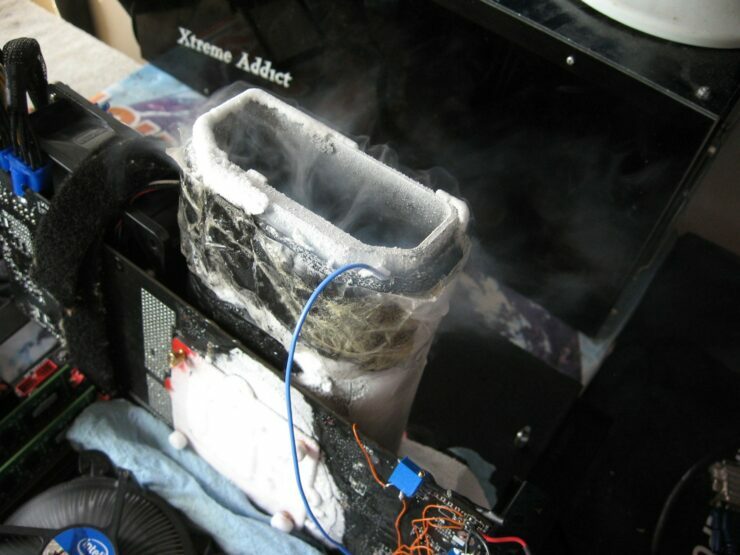 Since this was a LN2 overclock, the card was stripped off of its fancy DirectCU III cooler and mounted with a Kingpin TEK9 6.66 Fat Pot. 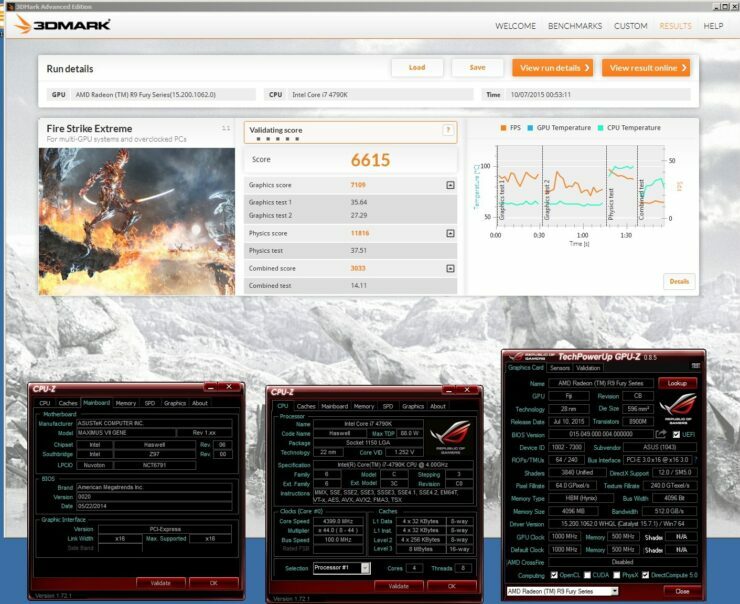 The overclocking utility that was used is GPUTweak 2 which gives full control over GPU, HBM, Voltage and Power Target. 1. 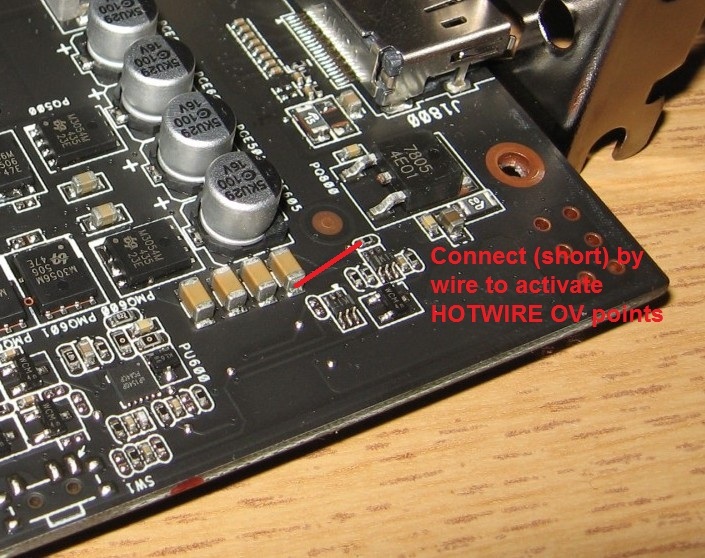 Use HDMI port (I used it with HDMI – DVI adapter), on my card screen is blinking on DVI after 0.95v rail mod. HDMI port is fine even at -180*C.
2. 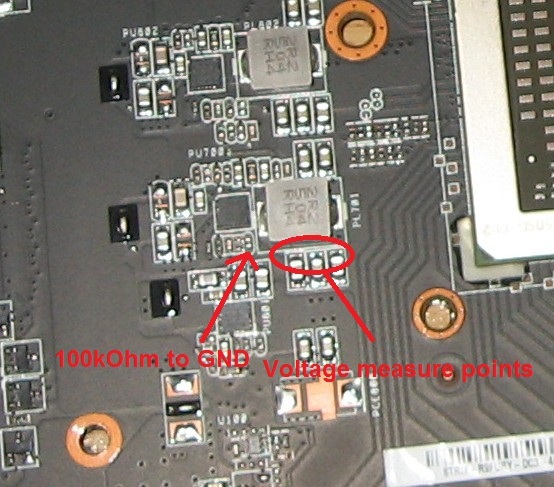 If you can’t enter OS at certain temperature – lower 0,95v rail (E.G. from 1,25v to 1,2v). 3. 0.95v rail set to 1,25v should be enough for -120 -160*C range. 4. With lower temperature (-50*C and more) you have to use higher VGPU to boot into OS! I had to use around 1.35-1.5v (stress) to boot into OS, it will be around 1.1-1.15v idle (stock is 0.9v in idle). 5. 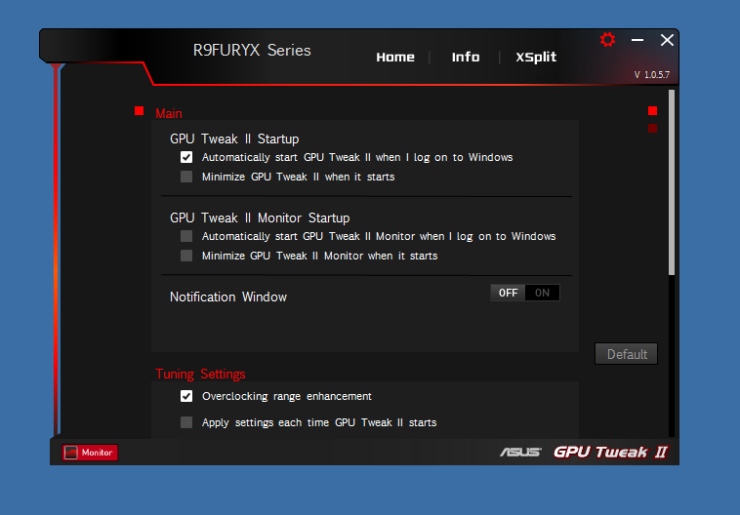 You can set by trimpot/hotwire VGPU OS “boot” voltage and later raise it by GPUTWEAK – it works. 6. 1000 MHz HBM (500 MHz is stock) is current maximum frequency which we can set. For that I had to use 1.55v VMEM (stock is 1.35v). Note that on some cards score might be lower with too high memories. 7. My card doesn’t have CB or CBB. 8. PWM is strong, 1.6+ VGPU wasn’t a problem with a delta fan on it. 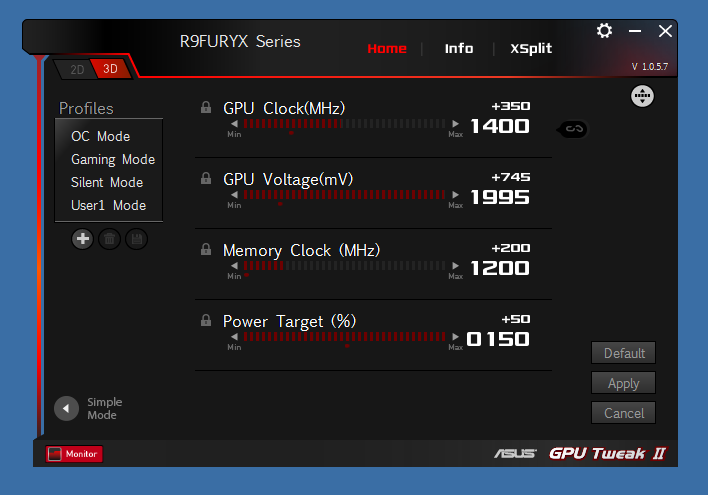 Stock Fury and Fury X bios have COLD SLOW bug below 0*C (3D mode doesn’t work), you need a special BIOS with a fix. 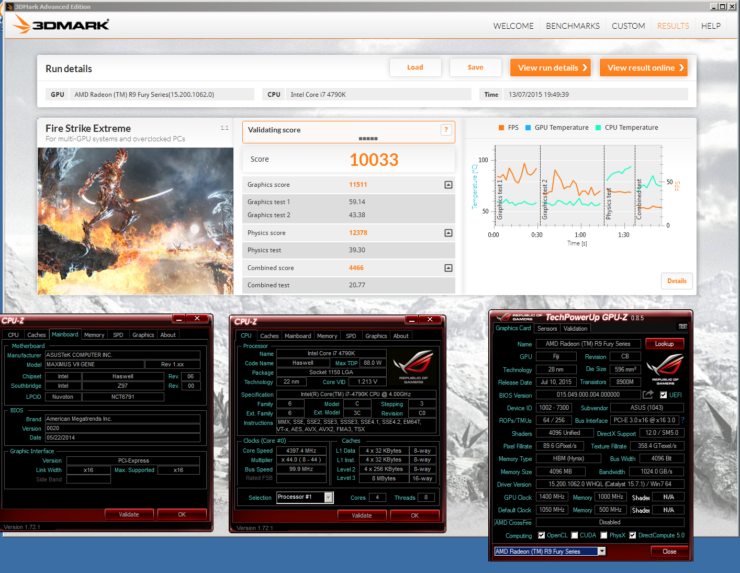 For now I used Fury X (ref) LN2 fixed BIOS but it works on Fury Strix cards.